PREVENTION OF MYOPIA: Children addicted to electronic products, affecting both their vision and cervical spine. And this magic walkie talkie can prevent them from getting into electronic products in early age. Children will like to be close to nature and their bodies will become stronger. KEEP IN TOUCH WITH KIDS: When go camping, children are always play around. And if you can't find them, you will be very worried about his safety. 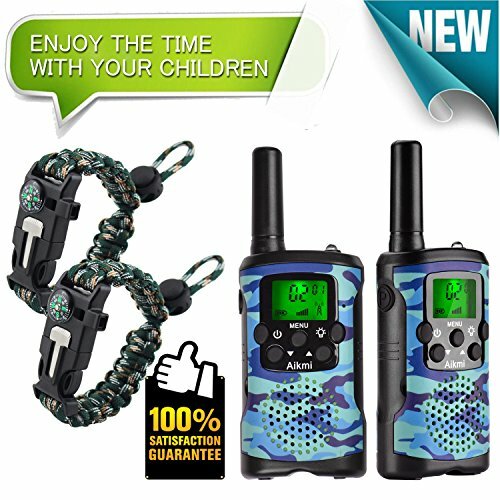 With this walkie talkie, you can communicate with your children anytime and anywhere. CHEAP AND FUNNY TOY: Compared to expensive mobile phones, you only need to spend about a tenth of the price to get your child to have at least 2 years of happy childhood. If there are quality problems within 2 years, we can refund the purchase or replace the walkie talkie for you. BEST GIFT FOR YOUR CHILD: Are you worried about choosing a gift for your child? This walkie talkie is affordable, special, useful and has many ways to play. It will definitely be one of child's favorite toys. He will be more willing to share little secrets with you through the walkie talkie. SATISFACTORY SERVICE: The childhood without wild adventure is incomplete. Realize your child's dream of an explorer and let him explore the treasures in the garden right away. We offer two-year quality guarantee for each walkie talkie. And the coupons are only available to the top 200 customers.